Asia's premier mixed martial arts organization is back at the state-of-the-art, 20,000-seater Mall of Asia Arena this Friday, December 11, in an event dubbed as ONE: SPIRIT OF CHAMPIONS. The fight card highlights the return of former women's boxing world champion Ana "Hurricane" Julaton as well as a bout featuring bantamweight stalwart, Mark "Mugen" Striegl. 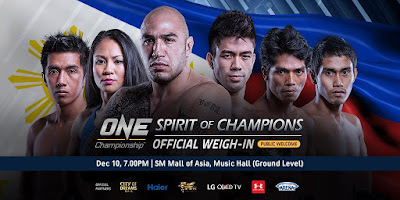 In the main event, Paul "Typhoon" Cheng steps in as a last minute replacement for original participant Chi Lewis-Parry, as he takes on Filipino-American Brandon "The Truth" Vera for the ONE Heavyweight World Championship. Fans have come to expect ONE to hold spectacular year-end cards in Manila, after the promotion has held successful shows here in the past. ONE is known to pit the best local Filipino talent against worthy international opposition, and this card is no different. At flyweight, Team Lakay's cool and collected Wushu specialist, Geje "Gravity" Eustaquio will make an appearance along with hair-flipping striking machine Eugene Toquero. Both fighters will take on Chinese opponents in what is expected to thrilling matchups in the sport's lighter weight divisions. Eustaquio will face Chinese fighter Yang Jian Bing in a surefire fast-paced flyweight bout. After two losses, one against Anatpong Bunrad and the other against Adriano Moraes, Eustaquio is eager to come back better and stronger, and showcase just how much he has improved since. Eustaquio, known for his well-rounded striking game, will need to outwork his opponent to emerge victorious in his home turf and return to his winning ways. Toquero is one of the most exciting fighters to come out of Manila. His time inside the ONE Cage has been memorable, as he’s delighted fans with impeccable striking and flashy combinations. 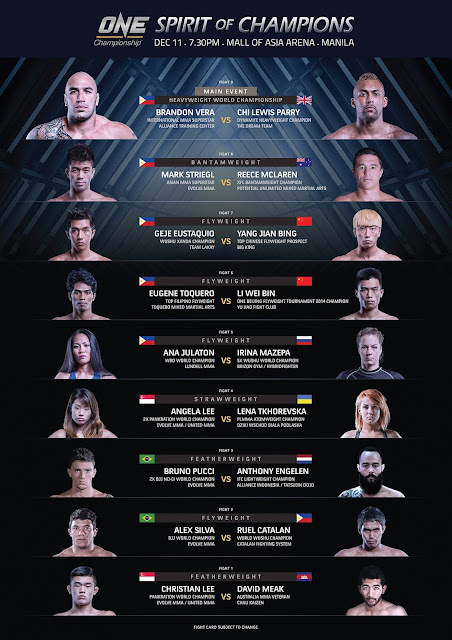 The former celebrity MMA trainer recently fell short of victory at ONE: TIGERS OF ASIA when he lost to Riku Shibuya via unanimous decision but he is set to do battle with China’s Wu Ze, who represents a chance for Toquero to get back into serious title contention. ONE: SPIRIT OF CHAMPIONS is poised to be an amazing card and is the perfect cap-off to what, by all accounts, has been an amazing year for ONE. As the sport of MMA in Asia grows in popularity by the day, ONE chief Victor Cui promises a continuous committment to cultivating local, homegrown heroes from the grassroots into bonafide superstars. "2015 has been an amazing year and we've seen so many different things, climbed new heights while breaking barriers and spreading the ideals of the MMA discipline," said Cui. "We've seen local MMA heroes emerge like unbeaten women's strawweight Angela Lee, and the man in the main event this Friday night, Brandon "The Truth" Vera. When we see fans cheering on their favorite fighters in a jam-packed arena like MOA, that's when we know we've done a good job." With a team of dedicated experts in their chosen fields at the helm of ONE Championship, the promotion has seen phenomenal success. Next year, ONE is expected to hold even more shows in iconic cities around Asia, nearly twice as many as this year’s output. Led by the promotion’s charismatic champions, and a passionate fanbase growing in numbers by the minute, ONE is in good hands at the turn of 2016.